Yua is a small man with fine lines on his face. He does not know how old he is but he remembers vividly the time when he was newly married and saw men with green uniforms holding rifles entering his village in the forest near the Sekatak River in Bulungan regency. He is from the Bulungan tribe, one of the 400 Dayak ethnic groups in Kalimantan. He said that the men in uniform came into his village in the early 1970s and forced the people to move closer to the river. Four decades have enabled him to recall the forceful relocation with humor. “They soaked them,” Yua said, chuckling. 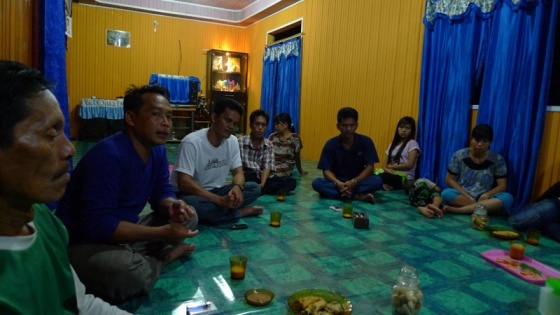 He was sitting on the floor in the house of Yohanes, 35, a village leader in Sekatak district. Yohanes explained that those who resisted the relocation were made to go into the river by the soldiers and stay neck-deep in the water for hours. Under former president Soeharto’s rule, many indigenous groups in East Kalimantan that are connected to the land and forest around them have been forced to relocate, their ancestral lands given away as concessions for mining and timber production. Yohanes said that seven indigenous settlements from the tribes of the Punan, Kenyah, Tidung, Belusu and Bulungan were relocated to what is now the Sekatak district. The central government gave the ancestral lands to Intraca Wood Manufacturing, a timber producer, owned by Hartarti Murdaya, he said. The Reformasi era after the fall of Soeharto, which included decentralization, did not do much to change the plight of indigenous people. Their lost lands remained in the hands of private companies. Internationally however, the rights of indigenous people are starting to gain ground through the non-binding UN Declaration of the Rights of Indigenous People, which includes the rights of indigenous people to “free, prior and informed consent” of projects in their customary lands. In Indonesia, legislative members are deliberating a bill on the recognition and protection of indigenous people. In Samarinda, the National Alliance for Indigenous People (AMAN) East Kalimantan coordinator Margaretha Seting Beraan said that the tension between the Unitary State of the Republic of Indonesia (NKRI) concept and indigenous people’s rights could be seen in the difference between the latter’s suggested draft of the bill and the legislature’s. In the bill, recognition for indigenous people’s rights was conditional on the principle of NKRI. “Actually, I don’t agree with the concept of NKRI if they homogenize groups. I only agree with the NKRI concept if pluralism is respected,” Margaretha said. “Basically we come from different cultures with different customs and laws that come together in one country,” she said. Back in Sekatak, village leaders say their people rely on the forest and land. Having been pushed out from their ancestral forest, many of their people have been criminalized for illegal logging. “We have at least 50 people jailed for illegal logging,” said Zainal Abidin, 37, leader of Ujang village in Sekatak. He said that people used the wood to build their houses, climbed the trees searching for honey from giant beehives and planted fruit trees and rice. “Some come from Sumatra and some come from the Philippines,” she said. “The Punan was believed to be the oldest group that came here and the rest mixed with people who came later and created subgroups,” she said. Each group would settle on a plot of land and develop its language and customs, she said. The borders of each group’s land are usually determined by the hills and rivers. “If the water from the mountain flows down toward a tribe’s village then it’s considered part of that tribe’s land. If the water flows the other way, then that belongs to another tribe,” she said. Each ethnic group understands the respective borders, she added, and customary leaders usually settled disputes using customary law. The authority of administrative governments and their power over land however, undermines customary ways. This not only worked to the government’s advantage in giving concessions to private companies, but also caused conflict between villages like in the case of Muara Tae, West Kutai, according to Margaretha. Kutai Barat regency has made concessions on Muara Tae’s land to a palm oil company. Masrani, a village leader, said the palm oil company started to bulldoze the ancestral forest there, which belonged to the Dayak Benoaq in Muara Tae, after a neighboring village claimed that Muara Tae’s land was theirs. He said that people from Muara Ponak village gave away land that was within Muara Tae’s customary village border to a palm oil company in 2010. While bulldozers have started to cut off the forest, the regent, Ismael Thomas, released a decree saying that the 638 hectares of land that were cleared were Muara Ponak’s. “But this is our land that has been passed on for generations. Our village border with the neighboring village is nature’s border. We have different rivers with Muara Ponak, there’s a hill and that becomes our border,” he said. Margaretha said that disputes of customary land could be solved using customary law, but that the government’s commercial interests in those lands undermined these laws. In West Kutai, customary leaders even had to be officiated by the administrative government, which made it easier for the regional government to control local communities there. “The customary leaders become government pawns because their position depends on the government,” Masrani said. As the national law does not explicitly recognize the protection of customary land, Margaretha said that the Muara Tae had community fought for their rights through various avenues, including by filing a complaint to the Kuala Lumpur based-Roundtable on Sustainable Palm Oil. Despite these efforts, the palm oil company continues to operate on their lands. East Kalimantan province has a slogan for its 2009-2013 development plan: “Building Kaltim for all”. The government is preparing big projects to speed up development. One of them is the Maloy Industrial Zone and International Port. Margaretha is worried how it will affect indigenous people in the area. Margaretha says indigenous groups are concerned because experience shows that the government’s approach has exploited nature, while the groups themselves have learnt to live and care for their natural surroundings.